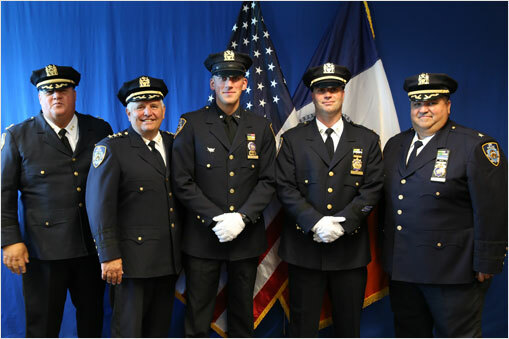 Department of Environmental Protection (DEP) Commissioner Emily Lloyd today presided over a promotion ceremony for two environmental police officers at the department’s Eastview Precinct in Mount Pleasant, N.Y. One lieutenant was promoted to captain and one officer was promoted to detective specialist. The promoted officers reside in Orange and Ulster counties. Since 2002, DEP has doubled the size of its Police Division to its current 200 sworn members. Deputy Commissioner for Police and Security Kevin McBride and Chief Peter Fusco joined Commissioner Lloyd in administering the oath of office. The DEP Police Division was established more than 100 years ago. It is charged with protecting the city’s water supply system, which includes more than 2,000 square miles of watershed land across nine counties, hundreds of miles of tunnels and aqueducts, 14 wastewater treatment plants, laboratories, and chlorination facilities. DEP police patrol the watershed by food, bicycle, all-terrain vehicle, motorcycle, boat and aircraft. They also maintain specially trained units that include a detective bureau, emergency service unit, canine unit, strategic patrol unit and aviation unit. Capt. Justin Kight joined the DEP Police in August 1999, and began his career on patrol in the Ashokan Precinct. He was promoted to sergeant in July 2002, and lieutenant in July 2003. Currently the Commanding Officer of the DEP Police Academy, Kight has also served as the commanding officer for the Ashokan Precinct. Det. Spc. Justin Romer joined the DEP Police in September 2009, and began his and began his career on patrol in the Eastview Precinct. In June 2012 he was selected for and transferred to the Special Operations Division, Emergency Service Unit. Romer is currently completing his final college course and will be receiving his associate’s degree in fire science. DEP manages New York City’s water supply, providing more than one billion gallons of high quality water each day to more than 9 million New Yorkers. This includes more than 70 upstate communities and institutions in Ulster, Orange, Putnam and Westchester counties who consume an average of 110 million total gallons of drinking water daily from New York City’s water supply system. This water comes from the Catskill, Delaware, and Croton watersheds that extend more than 125 miles from the City, and the system comprises 19 reservoirs, three controlled lakes, and numerous tunnels and aqueducts. DEP has nearly 6,000 employees, including almost 1,000 scientists, engineers, surveyors, watershed maintainers and others professionals in the upstate watershed. In addition to its $70 million payroll and $157 million in annual taxes paid in upstate counties, DEP has invested more than $1.7 billion in watershed protection programs—including partnership organizations such as the Catskill Watershed Corporation and the Watershed Agricultural Council—that support sustainable farming practices, environmentally sensitive economic development, and local economic opportunity. In addition, DEP has a robust capital program with over $14 billion in investments planned over the next 10 years that will create up to 3,000 construction-related jobs per year. For more information, visit nyc.gov/dep, like us on Facebook at facebook.com/nycwater, or follow us on Twitter at twitter.com/nycwater.